Chief poses with Rear Admiral Brown, Thirteenth District Commander, on a recent visit at ISC Seattle hosted by the Seattle Chiefs Mess. 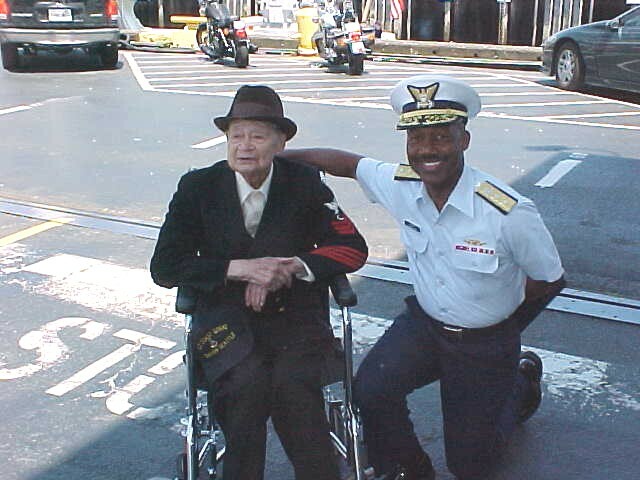 Eracleo Alimpolo, currently the oldest living Coast Guardsman, was born in Isabella, Philippines on April 23, 1898. It's believed he served in the merchant marines prior to leaving the Philippines. He left the Philippines and enlisted in the United States Navy on October 23, 1916 at the age of eighteen. He served in the Navy as a Steward until February 27, 1920. Eracleo has a autograph picture of Admiral Nimitzs with warm remarks. It appears he once served under him some where in his career. Although details are sketchy, it appears that after leaving the Navy, Eracleo attended a school named Brown Preparatory from 1920 to 1924. Some old notes and records indicate he may have also worked on a ship and possibly attempted to start his own business in Brazil. He enlisted in the United States Coast Guard on December 17, 1928 as Steward First Class at a pay of $84 per month. He successfully completed Officer Steward Training School in 1932. Eracleo remained faithful to his family in the Philippines and continually sent money home to help pay for the education of his brother’s seven children. Throughout his long career in the Coast Guard, Eracleo served aboard several ships, including the Alexander Hamilton (1937), which was a full sail vessel. He also served aboard the cutters Tahoe, Algonquin, Pontchartrain, Madrona, Trais, and Clover. Eracleo also served at various shore units in the Miami, Florida, area as well as Seattle, Washington and Juneau, Alaska. Eracleo’s last assignment in the Coast Guard was aboard the USCGC Fir before retiring on October 1, 1957 as a Chief Steward after a total of 22 years, eight months and 14 days of military service. Eracleo settled in the Seattle area and went to work at Boeing Aircraft in 1957 and eventually retired from there in 1970’s. In his late 90’s Eracleo was founded beaten and robbed in downtown Seattle. . It was soon after that he was moved into Guardianships of Seattle where he remains today. At the age of 103, Eracleo continues to exercise daily and enjoys short walks and letters..